Terroir: Lirac is situated on the right bank of the Rhône River, west of Châteauneuf-du-Pape between the towns of Orange and Avignon. 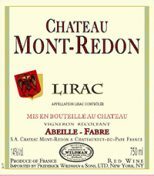 Château Mont-Redon’s 35 hectares of vineyards are located on a plateau with soils of sand and pebbles, similar to nearby Châteauneuf-du-Pape. Summers are dry and hot with the warm Mistral winds keeping away any humidity. Vinification: Grapes are selected and hand harvested beginning in early September. Upon arrival at the winery they are destemmed and macerated at cool temperatures for a period of two to three weeks. Punch down of the cap is frequent to ensure maximum color and extraction. With fermentation complete approximately 1/3 of the wine is aged for a short period in small oak barrels with the remainder remaining in large vats. The wines are then blended and aged for an additional 18 months prior to bottling. A result of selective sorting and a blend of cask and vat aging, this cuvee offers a fruity, floral and spicy profile resting on a generous and refined mouth. "Red-cherry and blackberry notes are shaded by tones of anise and forest floor in this full-bodied, Grenachedominant red. Red-currant acidity lends crispness to the midpalate, accented by fine but drying, grippy tannins on the finish. Enjoy this elegantly structured but easy-drinking wine now through 2026."